The long awaited tax reform H.R.1 was finally passed December 2017, but how will this affect the trucking industry? 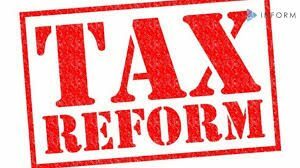 Because of the new Tax Reform bill, corporations will see huge decreases in their taxes in order to bring business back to the United States and to also reinvest in their workers. The legislation reduces the U.S. corporate tax rate to 21% from 35% for businesses and doubles the estate-tax exemption to $11.2 million per person. The bill also contains a clause to end the penalty for individuals who do not have health insurance starting in 2019. For many company truckers, all this may mean higher wages, by either paying less taxes (being in a lower bracket) or by receiving a raise from their employees. After all, companies are getting a huge tax cut, they will surely pass it on to their workers, right? Company drivers have many questions however about the new tax reform. Among the most concerning, is the question about standard deductions. The standard deduction for all taxpayers will nearly double. For single taxpayers, it went from $6,350 to $12,000. For married tax payers filing jointly, it went from $12,700 to $24,000. However, under the new law, there will be no deduction allowed for work-related expenses for company drivers, and all other employees paid on a W-2. That includes per diem deductions. Our question is this? If a single taxpayer ( vs. married filing jointly) has a standard deduction of $12,000 and their per diem deductions have run on average over the years to be $15,000.00, will the new tax cut hurt them? Note: Truck driver wages have not increased in 30 years. And don’t forget, this is just per diem, what about all the other business related expenses which will not be allowed? The next questions is this; Will it benefit the driver if carriers offer per diem pay in addition to mileage pay? It depends. If the carrier is reducing the CPM portion of drivers pay and then paying the difference as a non taxable pay, in our opinion it will benefit the carrier and not the driver. However, at a time when carriers are panicking about the so called “driver shortage” it would benefit them greatly, in both hiring incentive and retention, to offer per diem in addition to their mileage pay. We recently invited Dennis Bridges of eTruckerTax to share information with our readers in order to lessen the confusion and correct any misinformation they may have read. 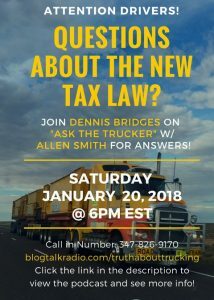 Mr. Bridges will also be our special guest on Saturday Jan 20th at 6apm et on AskTheTrucker “live” “Tax Reform and the American Trucker. He will be taking questions as well as outlining how the new tax reform will affect all truckers, company drivers and owner operators. To call in and be part of the show call 347-826-9170.
below is the bulk from his article. First, Who is Dennis Bridges? Dennis Bridges is a CPA, a best-selling author, and Executive Director of eTruckerTax. eTruckerTax is based in Atlanta and assists company drivers, owner-operators and fleet owners throughout the U.S. with their income taxes as well as minor or severe IRS problems. Bridges has been in practice for over 30 years, and for the past 25 years has specialized in assisting transportation professionals. 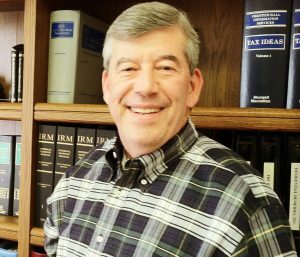 Bridges has written numerous articles providing guidance to truckers and fleet owners on how to legally minimize their tax bill each year. Additionally, he has spoken at the GATS and Mid-America Truck Shows, and numerous other trucking events throughout the U.S.
Dennis is the author of three books: On Level Ground with the IRS, The Truckers Tax Relief Toolkit, and What to Do When the IRS Comes Calling, which last year became a Number 1 Bestseller on Amazon, in the category of business books. This new tax law was passed and signed back in December. CPAs (like me) and tax attorneys all over the U.S. have spent day and night connecting the dots and figuring out the winners and losers. Sadly, there are unqualified people, even well known in trucking circles, that are making incorrect statements that are Exhibit A that they have no idea what the changes mean. They are giving wrong and bad advice to company drivers, owner-operators, and fleet owners. Look, I’m not about boasting at all. But I am about credentials and speaking with authority. Beginning in 2018, the first 20 percent of net income from “pass-through” entities will be tax free to the owner/shareholders of these entities. The are articles state that a sole proprietorship and an LLC are “pass-through” entities, are misleading. Presently the two pass-through entities for businesses are S-Corporations and Partnerships. Here at eTruckerTax, our whole mission is to help ALL trucking professionals keep MUCH more of your hard-earned money, whether you are a company driver, an owner-operator, or a fleet owner. All of this to say, we’ll spare you the misery of wading through the changes that affect truck drivers and fleet owners. This change applies to all W-2 employees, including company drivers. Previously, if you itemized your deductions on your income tax returns, you were allowed to deduct any unreimbursed employee expenses on Form 2106. This included the per diem expense of $63.00 per day times the number of days on the road. So, under the new law, there will be no deduction allowed for work-related expenses for company drivers, and all other employees paid on a W-2. 2- The standard deduction for all taxpayers will nearly double. You read that right: DOUBLE! For single taxpayers, it went from $6,350 to $12,000. For married tax payers filing jointly, it went from $12,700 to $24,000. Under the new tax law, owner-operator and fleet owners (and other businesses) that use a “pass-through” entity for doing business will receive the first 20 percent of their net income tax-free. Recent trucking articles have stated that sole proprietorships and LLCs are “pass-through” entities. Presently, pass-throughs include only S-Corporations and Partnerships for business purposes. 2) If you are a sole proprietorship, we can set up an S-Corporation for you, OR you can get your own LLC and we can then convert your LLC to an S-Corp. Even Better News: Trust me—getting the first 20 percent of your income tax-free with an S-Corp is a VERY good reason to get or convert an S-Corp.
Want an even better reason to use an S-Corporation? Even better than getting the first 20 percent of your income tax free? Get this: By using an S-Corporation for your business instead of a sole proprietorship or basic LLC, you reduce your chances of an IRS audit by 75 percent. What? Cut your audit chances to nearly zero just by using an S-Corp? Yep! And this is not me talking—these are the IRS’s very own stats. Seriously, whether you do it for the mega-reduced audit chances, or for getting the first 20 percent of your income tax-free, definitely do this—if you do nothing else this year. Above, we were discussing S-Corporations, in which the net income “flows-through” to the owner’s return(s), and is taxes at his or her marginal rate. Larger trucking companies, and even some smaller ones, may be set up as “C-Corporations”, or what we usually refer to as regular corporations. Regular corporations are taxed at the corporate level, previously at a rate of 35 percent. Under the new law, regular, or C-Corporations will now be taxed at only 21 percent. This was intended by the President and Congress to serve as an incentive, especially to large companies, to purchase heavy machines, which should directly and indirectly help the trucking industry. Just a small example to give you an idea of the magnitude of the possible savings. Let’s say you have a trucking company with a net profit of, say, $100,000. Under the old tax law, the tax bill would have been approximately $35,000. But under the new tax law, the tax would go to $21,000, for a savings of $14,000. This represents a reduction in the tax bill of 40 percent! Our team at eTruckerTax wants to be your one source for reliable tax guidance, on the new tax law. And how to use it to your advantage. Click here for easy-to-follow steps on how to keep a lot more of your hard-earned money! Bridges and his entire team at eTruckerTax believe that trucking professionals are the glue that held our economy together during the recession of 2008 to 2012. Helping drivers to keep much more of their hard-earned money is their way of tangibly expressing his gratitude for the sacrifice of all drivers.